The sun is still at the minimum of its cycle. 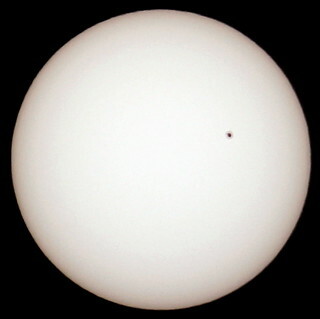 Following a period with no sunspots at all, now the large sunspot AR2738 is crossing the visible disc. Shot through a TS Optics 420 mm/70 mm ED apochromatic refractor with a Canon EOS600D DSLR. A D5 white light filter was fixed in front of the telescope. This filters out 99,999% of the incident sunlight. Even the remaining 1/1000 of one percent still produced an image that was so bright, I had to choose an exposure time if 1/1000 seconds at ISO 100. What does that tell us? Never look at the sun through an optical instrument if you value your eyesight, is what that tells us.